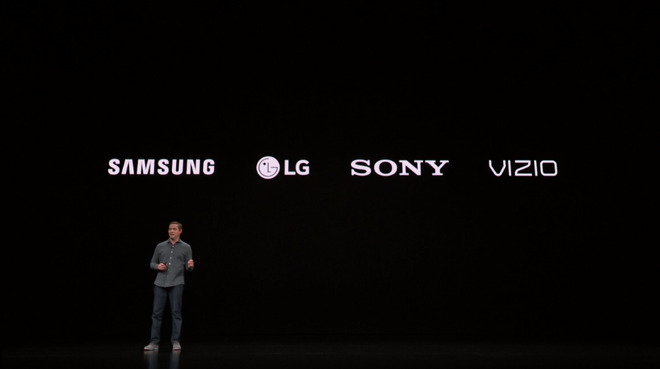 Starting in the spring, smart TVs from Samsung will be the first to offer the updated Apple TV app experience, allowing users to watch content from the service on their television without needing to use an Apple TV. Other vendors including LG, Sony, and Vizio will bring the app to their smart TVs shortly after Samsung. The expanded access will not be limited to just smart TVs, as Amazon's Fire TV streaming box and devices from Roku will also gain their own Apple TV apps. The announcement means there will be more potential customers for Apple's just-introduced Apple TV Channels services, which offer users an easy way to subscribe to third-party video services offered by premium channels and networks. Adding more devices capable of viewing the content opens up the service to more potential users, and in theory higher revenues for Apple. Apple is also expanding the availability of the Apple TV app to over 100 countries, up from the current roster of just ten. Lastly, the Apple TV+ service will offer a selection of original video content for viewing from within the app. If only they’d open up their TV app and IMessage to Android phones and tablets, I’d seriously consider a move. Curious to see if I can load the Apple TV app on my current Roku HDTV. I am also wondering if this new App will work with my Apple TV 3d generation. Apple TV App on 3rd party devices/TVs; surprisingly but awesome. I’ve been trying to cut the Dish cord for about a year now. I look forward seeing what Apple delivers. Tired of being soaked by satellite companies. My only problem is lack of speedy internet (now have only 6Mps) and too far to get local programming for weather. Could care less about murders happening in Springfield, MO. All the Apple pessimism gets old. I love good entertainment. Happy to drop reality TV. Never watch it, won’t support it. So I cobble together streaming services. Good to see some one that will clear out the weed patches of programs like “The Bachelor”, “Survivor”, and “The Voice”. I wish Apple good luck in their efforts. Nice feature restarting a movie where you stopped. Now if they only could figure out how to start from the point where I fell asleep. In all seriousness it looks like we are getting some nice improvements to the TV app. The other thing worth noting is the several references to machine learning during this keynote. This is exactly why I suggest in the various forums that an A12 based device should be the minimal purchase for anybody getting in to iOS devices. Frankly Apple prepped the hardware for that reality last week. That doesn’t mean everything machine learning wise will be done locally on the device, it just highlights where tech is going. Could possibly do that in conjunction with an Apple Watch. Huh? If they opened iMessage up to Android, you'd consider a move from Android to iOS? How does that make sense? Given what I saw today, I'm less excited about a TV with Apple TV built in. I sincerely hope I''m wrong. How is my privacy going to be protected on Smart TV that track user habits by default? If that's a concern for you (and it should be), turn off all the Smart TV features and remove internet access from the TV. Then go buy an Apple TV and plug your internet access into that. Problem solved! That's my plan. Apple TV 4K on every TV in the home. Plus I just realized that most TV just have Fast Ethernet so you're dealing with a TV that can't stream anything beyond 100Mbps. That being said the bell maybe tolling for hardware Apple TV. Nice feature restarting a movie where you stopped. Is this something new?! Netflix and Hulu do this. I think Amazon does too (but I don't watch as much there). A 4K Bluray has a rate of ~50 Mbps. Any current 4K smart TV has no need for beyond 100 Mbps. Why would it need gigabit Ethernet? The only case I could imagine where a TV needs a faster rate than 100 Mbps would be if it can display higher resolution/frame rate than the current panel -- which essentially means you have to replace that TV to obtain it. It doesn't. It's just me chuffed about the fact that you spend near $3k on a TV and it has less networking bandwidth than a 40 dollar switch. A lot of networked Audio devices have the same because there are no audio codecs that require that much bandwidth. How about Google Chromecast? Will it work on that?